In the Horizons region the overarching policy and rule framework is managed under Horizons One Plan. One Plan has been in use since it was notified in May 2007, and became fully operative in December 2014. It seeks to balance the use of natural resources for economic and social wellbeing with keeping the environment in good health. Four key community concerns were identified during Plan development. These are water quality degradation, increasing water demand, unsustainable hill country land use, and threatened indigenous biological diversity. One of the responses to help deal with water quality degradation is to review management of nutrient, sediment and bacteria losses to ground and surface water from all sources, including agriculture, municipal waste treatment discharges and other point source discharges. The Plan identifies specific catchments where management of contaminants from intensive farming land uses is required to help manage water quality. What this means for the agricultural sector is that dairy farming, horticulture, arable and irrigated sheep and beef farming enterprises within target catchments of the Manawatu-Wanganui Region need to review their current practices and take steps to reduce possible nitrogen, phosphorous, sediment and E.coli contamination of ground and surface water bodies in order to gain a resource consent. 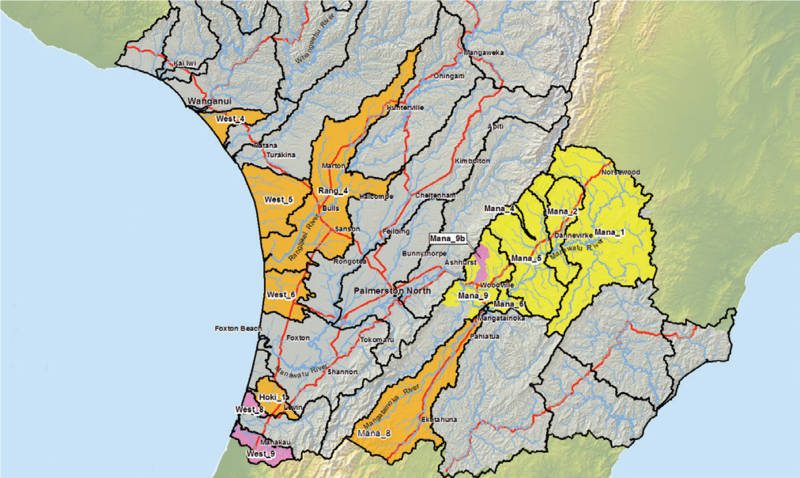 There are around 430 farmers included in the target catchments, with the majority being in the Tararua district which is home to the upper catchments of the Manawatu River. The other main area affected is the Rangitikei catchment, and there are also a number of smaller lake and stream catchments involved. Check the catchment map and flowchart to see if you need consent. If you are still unsure whether or not you need to apply for consent for your farm contact the Rural Advice Team at Horizons Regional Council (0508 800 800). The target catchments are outlined in the following map. More detailed maps are available on request from Horizons Regional Council. Does your farm need consent? Any dairy farmer with part of their land in a target catchment may require a consent for their milking platform. Where a runoff is associated with the farm it may also need to be included in the consent. 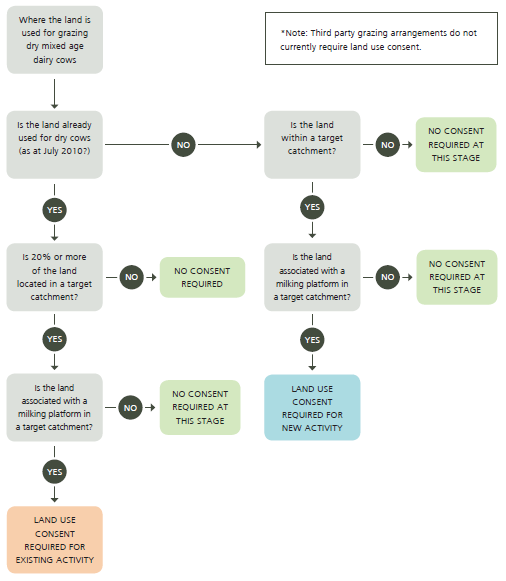 Follow the flowchart below to see if your land has to be consented. Does your runoff need consent? b. Complete a restricted discretionary application following Horizons new guidelines. You are required to identify areas of risk on your properties and take steps to reduce amounts of these contaminants entering water bodies. Dairy farms must exclude dairy cattle from waterways that are permanently flowing or have an active bed width greater than 1m; and wetlands and lakes that are rare or threatened habitats. *Note: Horizons defines a waterway as “the beds of rivers/streams that are permanently flowing or have an active bed width greater than 1m”. This results in the inclusions of more waterways than the Sustainable Dairy Water Accord definition. You must supply your dairy company with information to allow nitrogen loss and nitrogen conversion efficiency to be modelled. Companies will report comparative performance back to you to drive continuous improvement in nutrient management. Data must be collected and performance benchmarked for 85% of dairy farms by 30 November 2014, and 100% of dairy farms by 30 November 2015. You are required to be 100% compliant with regional council effluent management rules and/or resource consent conditions. 100% of dairy farms must comply with water take and use rules, and/or resource consent conditions. 85% of farms will be required to have water meters installed by 2020. 100% of dairy farms must exclude dairy cattle from waterways. 100% of farms with defined waterways will be required to have a riparian management plan by 31 May 2020. Planting will need to be completed by 2030. 100% of regular stock crossing points must be bridged or culverted by 31 May 2018. Fish & Game and the Environmental Defence Society (EDS) recently sought a declaration from the Environment Court that Horizons was implementing their own regional plan, The One Plan, unlawfully with respect to granting consents for intensive land use, including dairy farming. They were successful in their case and the declaration provided by the court has led to Horizons placing land use consent applications for existing dairy farms on hold from March 2017 while they considered the implications of this declaration for applicants. In short, the Court declared the council must enforce the nitrogen leaching maxima set out in Table 14.2 of the One Plan. This will have significant impact for farms that are on free draining soils with moderate to high rainfall and are not yet consented. At a Horizons Regional Council (HRC) Strategy and Policy committee meeting on 9 August, Council staff reported back on their approach to consenting the remaining farms. For those with a resource consent in place, the changes by HRC to the consenting process won’t impact on you. Where existing use occurs on land with 50% or more of the land in LUC class IV to VIII and greater than 1,500mm annual rainfall the application will detail a plan to reduce contaminant loss as much as practicable. This can be processed as a restricted discretionary consent. Where CNLM cannot be met in year one and the above exception does not apply, the application must detail a plan to manage down to Table 14.2 within 4 years from date the consent was due. This application will also be processed as a restricted discretionary consent. The Council acknowledges that meeting the CNLM will be financially untenable for some farmers, especially those in high rainfall areas with freely drained soils. This led to a further restricted discretionary consent pathway being considered to grant a consent at a CNLM above that specified in Table 14.2. It appears, while a pathway is technically possible, it is practically infeasible for an individual farmer to gain consent above the table. The committee endorsed the staff recommendation to investigate options for a plan change, however, this will take time and the outcome is far from certain. The full set of council papers can be downloaded here. The best overview is provided by: “17-143 Implementation of Intensive Land-Use Rules under the One Plan”. As part of being a responsible sector, we need to help find ways to deliver the environmental outcomes expected of us, but not at the expense of wholesale failure of farm businesses. DairyNZ will continue to work with HRC, Federated Farmers and your dairy company to find a consenting process that will allow you to continue to farm in a competitive and sustainable way. Where to next for farmers? Assessing your baseline nitrogen leaching to understand the gap between your current practice and the targets in Table 14.2. Assess your options to reduce N-loss to meet the table. Decide on the most likely consenting pathway for the farm. If you can reasonably achieve the CNLM targets we recommend you apply for a controlled activity consent and get some certainty for your farm. It will not be wasted effort, as regardless of what might happen with a plan change there will be expectations of reduced N-loss at a farm level. DairyNZ provides advice on how to go about on the Nutrient Management page. Longer term, we are working with HRC to gather evidence and understand options for adjusting the One Plan through a plan change. We’ve also had requests from farmers for DairyNZ to organise two-way communication between farmers and HRC at a governance level to ensure that farmer views are properly represented. We are currently working towards forming a representative group involving key farmers and sector organisations. Isn’t water quality improving in the Manawatu? Water quality has been holding steady and improving marginally over recent years. Dairy farming has played a part in this, including by shifting the application of effluent to land and fencing off waterways. However, water quality has still not reached targeted levels and further work is needed. What is land use capability? Land Use Capability (LUC) is an estimate of the land’s capacity to sustain productive agricultural use over time based on the physical characteristics of the land including soil type, drainage, aspect and slope. The analysis results in land being ranked on a scale from I-VIIl, where Class I is elite land suitable for intensive arable uses, and Class VIII is non-productive land unsuitable for agriculture. Table 14.2 of the Horizons One Plan sets out nitrogen limits in targeted catchments based on LUC. Each LUC has been assigned a permissible N-loss limit based on the theory that land with higher potential (i.e. Class I) should have a higher permissible N-loss limit because it is able to be farmed more intensively. Can I challenge the LUC maps to get higher permissible N-loss? Yes you can challenge the LUC classification of your farm’s soils by getting a qualified soil scientist to assess your farm. Contact Horizons for names of appropriate people should you wish to pursue reclassification. What happens if I want to sell my farm? The conditions attached to the consent will remain with the property and the new owner will be responsible for meeting the conditions. You will need to ensure that your consent has been updated to the most recent version of OVERSEER®and that your real estate agent and any potential purchasers are fully informed of your farm management policies and the commitments you have made as part of the consent. 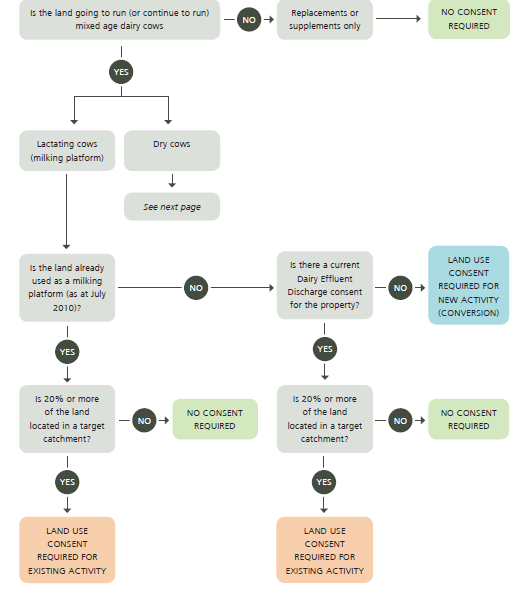 If you want to sell just one part of the consented farm area, for example a runoff block, then you will require either a variation to your current consent or a new consent to reflect the impact of the change to the resource base and management plans. You should work with a suitably qualified person to determine your baseline N-loss to water, which will inform potential purchasers of likely consent requirements. This allows the new owner to apply for the consent based on management practices and mitigation options that they are prepared to implement.